Do you sometimes forget your reason for homeschooling? Are you having trouble seeing the forest for the trees? Are you overwhelmed with the homeschool record keeping requirements of your state? Or maybe you just wish you had a way to assign lessons to children & adjust them on the fly. If any of these sound like you, you might benefit from Homeschool Office from Lord Heritage. A full featured, Internet-based homeschool administration program, Homeschool Office is based in both God & business-oriented principles. The interface is divided into 5 sections to track almost everything you could think of related to the administration of your homeschool. Plan – schedule course goals, build a master schedule, setup lessons and even plan your budget. 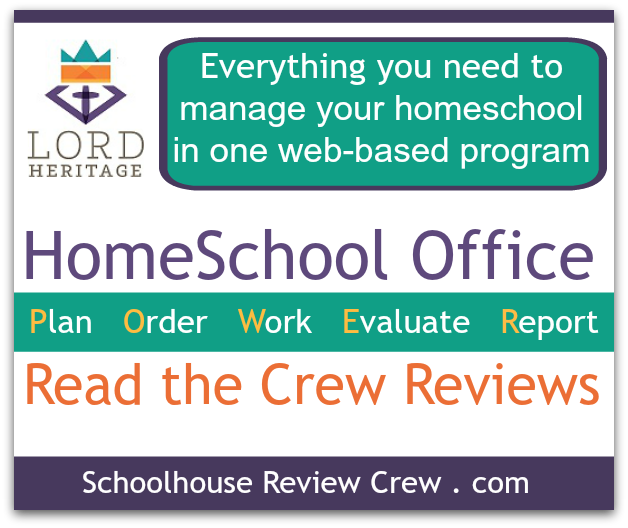 Homeschool Office allows you to track multiple students, grades and subjects. You can set up your school year calendar and lessons can be automatically populated on all school days. You have the option to schedule both as an all-day/anytime list and also during a particular time of day. They can also be easily moved around on the fly to account for changes both backward and forward. When using the program for multiple years, you can copy lessons for curriculum to new students without having to re-enter the information. Additionally, you can track outside classes, co-op, other students, tutors and the local school district. You can add appointments to your calendar, as well as create to do lists for your children for things like chores or instrument practice. There are also options for creating special projects and creating the budget & planning for future years. Plus you can set students up with their own account for independent work. Homeschool Office is web based and is accessible from any device with a browser, including your iPhone, iPad or android device. A big thank you to Jen Steed of Happy Little Homemaker for writing this introductory post.